Rather than re-invent the wheel, so to speak and make a long, repetitive post on how one should prune Fig trees, we would rather refer you to Google and the numerous photo's and pruning tutorials by simply typing "Prune Fig Tree" into the search bar. What we will do is make some local observations of Fig trees in and around Fort Smith and write why we think you should prune your Fig tree(s) and add to it some degree of Winter protection. I see them all the time. Short, stubby Fig bushes that undoubtedly die back to the ground every year and end up with numerous unripe figs at the end of the year. If the owners do get any ripe figs from them, they are probably of much lesser sweetness and quality than those figs which ripen at the proper time, in the heat of the Summer and early Fall. "These aren't very sweet. I didn't care for them at all"
That was the new owner of the Unknown Lake Spur Fig we have written about previously. The old mother tree was burned to the ground and re-grew as a bush form from the roots and put on late figs that ripened too late to be any good. Others have compared this same variety with Ischia Green and JH Adriatic, far as flavor and it ranked right up there with them. So what's wrong with bush form figs? Nothing really, providing they are pruned and Winter protected. Pruning to five or six main trunks on a bush form is much better than say twelve or more trunks that crowd each other out. Adding Winter protection of some sort to ensure at the very least, the main trunk(s) survive, makes it so the tree does not have to start over from the ground every year, which leads to late forming and late ripening figs, if they ripen at all. Pruning will open up space between the limbs, providing aeration and sunlight to the figs, making for a much better fruit quality, taste and size. Also makes it easier to bind up the limbs come Winter time for wrapping or making a wire cage to fill with leaves or wood chips for insulation. Getting a Fig tree should be a rewarding experience, yet I know there are countless, disappointed people who think they just can't get a fig tree to make figs! Prune that bush! Protect it over Winter and it will reward you in due season. Now for tree form figs. These are those which have been pruned early on and/or trained properly to have a main trunk or a few mains. They usually come up a few feet and branch off to a few main branches which are then pruned back to every year so that new, fruit bearing limbs grow long and healthy, providing bumper crops of figs every season and usually within reach of the owner to easily pick without a very high stepladder. Nothing particularly wrong with huge fig trees, we're just saying they would produce more, better figs and be easier to harvest and maintain with pruning. 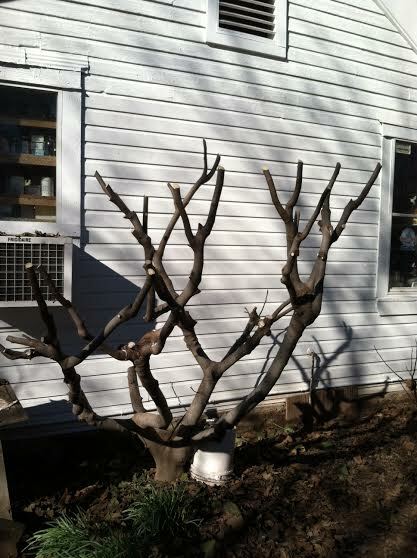 Here is a photo of the Hardy Chicago Fig, owned by the owners of The Squash Blossom Store in Dora, after it's yearly pruning. This tree is 15 - 20 years old and is considered too tall for some but lets look in detail at the pruning concept behind it. This year, it has been pruned back to leaving two nodes on limbs of this year's growth. Next year there will be multiple new limbs grow from every one of those "stubs" as well as random limbs from elsewhere on the tree and they will all put on figs. It's clear to see it has not been done in this manner all of it's life but has some good main supporting limbs coming off a stout main trunk, nearly the diameter of a five gallon pail. Some varieties of Fig make two crops each year. The first, early crop is known as "Breba". Breba figs form on last year's wood and ripen in early Summer. The later crop is known as "Main Crop" and will be forming new figlets as the Breba crop is ripening. Main Crop figs usually begin to ripen in the Fort Smith area in August and some varieties continue to ripen Main Crop well into lat Fall, until it gets so cold the figs are of much less sweetness and quality. If your particular fig variety is such that makes Breba figs then some year old wood may be desirable if it is a good Breba producer. Some do not care for Breba figs and prune for new limb production to maximize Main Crop figs. The Fig forums listed in the right column links contain a lot of information on fig types and pruning techniques, plus a lot of friendly helpful folks who love to answer questions or will gladly guide you to pertinent information. As for us, we offer free fig tree pruning in and around Fort Smith. We get the limbs in return and may return some of them back to the owner of the mother tree as rooted cuttings if that is their desire. Use the contact form in the right column to send us a message if you wish to acquire this service.